Britain Stronger in Europe has released its final poster today with just two days until the UK votes whether to remain or leave the European Union. 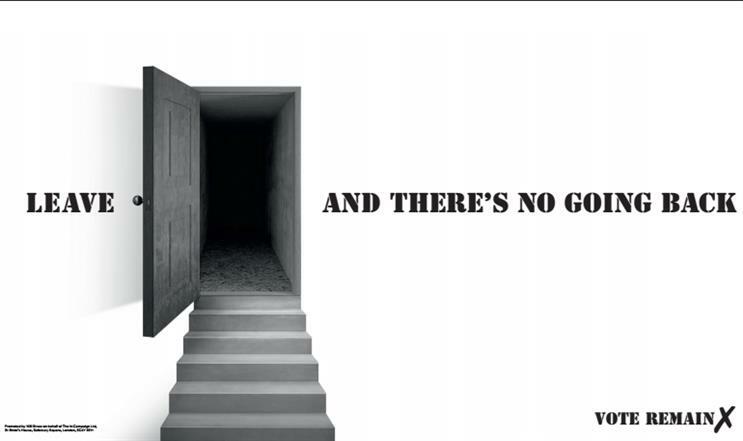 The poster, created by M&C Saatchi, depicts stairs leading up to an open door that leads into darkness with the line "Leave, and there’s no going back". With Remain and Leave neck-and-neck in recent opinion polls, the Stronger In campaign is hoping to reinforce its message that a vote to leave is high risk and fraught with uncertainty. Bill Gallacher art directed the poster, while creative partner Jeremy Sinclair wrote the copy at M&C Saatchi. Henry Chilcott, the Stronger In campaign director at M&C Saatchi, said: "The public have been assailed by arguments and noise on all sides over the past few weeks. "With two days to go, it was our role to distil the argument into one poster; if we walk out the door with all the uncertainty and danger it represents, there’s no going back. "On a deeper level the darkness behind the door raises the spectre of the path a Leave vote could take the country down."